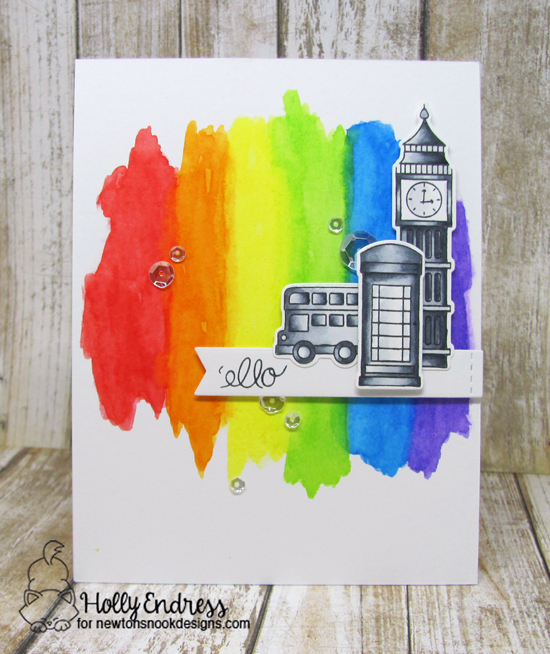 This beautiful rainbow card by Holly will brighten your day! She created a gorgeous rainbow background for her card using distress inks. Then she colored images from our Newton Dreams of London stamp set using only shades of grey to create a lovely contrast to the colorful background! She added the images to her card, trimming them out with the coordinating Newton Dreams of London Die Set. This is such a fun idea! To finish off her card she added the simple "ello" stamped onto a little white banner and some fun clear sequins! This card is so cheerful! It feels like a rainbow after a rainy day! Thank you, Holly, for inspiring us today! You can find more of Holly's beautiful creations and say hello to her over at her blog, Hollybeary Creations! Fantastic card! I really love the color background and gray stamps against it! Great idea!! !